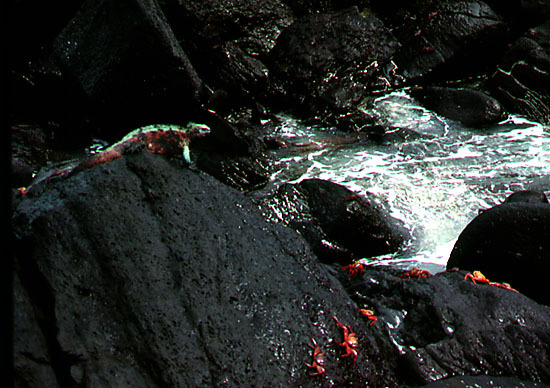 An Española marine iguana plays king of the mountain while a California sea lion romps in a tide pool and Sally Lightfoot crabs scuttle about the rocks. The Galápagos Islands were named for the giant tortoises found there when the islands were chanced upon by an off-course Spanish ship in 1535. The Spaniards, including the Bishop of Panama, found the islands nearly devoid of fresh water, and so difficult to sail away from due to contrary currents and winds, that the good bishop reported the islands worthless. As a result, the Galápagos archipelago remained unclaimed until 1832, when the Ecuadoran government decided to establish a penal colony there. In the meantime, however, the islands had been visited by buccaneers, whalers and sealers. The buccaneers found the islands a convenient hideout. The whalers and sealers found the tortoises a ready supply of fresh meat, easily captured. The tortoises, belonging to the species Geochelone elephantopus are vegetarians, and truly giants-- big males can weigh as much as 270 kg (660 lbs); females are considerably smaller. No one knows just how long-lived they can be, but it is generally thought that they can live well over 100 years, perhaps more than 150 yrs. And, as the 18th-century whalers discovered, they can live for up to a year without food or water. The great beasts were taken aboard ships, placed in the dark holds without sustenance, to serve the sailors as vital fresh meat supply on whaling cruises often lasting over a year. 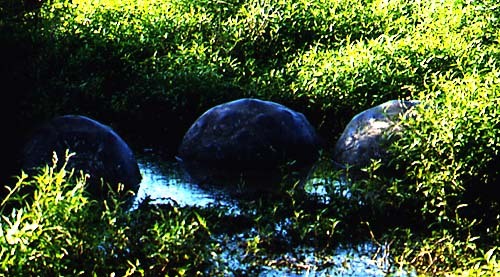 Although capable of surviving long periods without food or water, the tortoises certainly enjoy water when it is available. The highlands of the larger islands are moist and seasonal ponds or permanent marshy areas can be found. Here three giants enjoy a good long soak, looking much like glacially deposited boulders in a swamp. 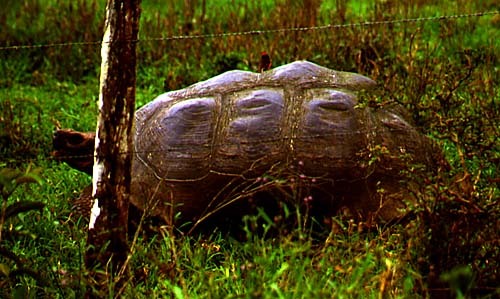 Note the rounded, dome-shaped carapaces typical of the tortoises that have evolved on the better vegetated islands. On smaller, lower islands that are hotter and drier, vegetation is scarce, and the galápagos have carapaces with highly arched neck openings, giving these tortoises, known as "saddlebacks", a higher reach than the dome-shelled subspecies. This appears to be an evolutionary adaptation that helps the saddlebacks browse on plants that would otherwise be beyond their reach. When the islands were discovered, there were 14 or perhaps 15 distinct subspecies (sometimes referred to as races) of Geochelone elephantopus, all endemic to the Galápagos Islands. Unfortunately, depredations by the whalers and sealers resulted in the extinction of 3 or 4 of these subspecies. There are records of individual ships taking away as many as 600; overall it is thought that the sailors took 150,000 to possibly 200,000 tortoises from the islands, until there were so few left that it was no longer worthwhile for ships to stop here for meat. Tortoise harvesting continued into the present century: in the 1930s they were slaughtered and rendered for oil. 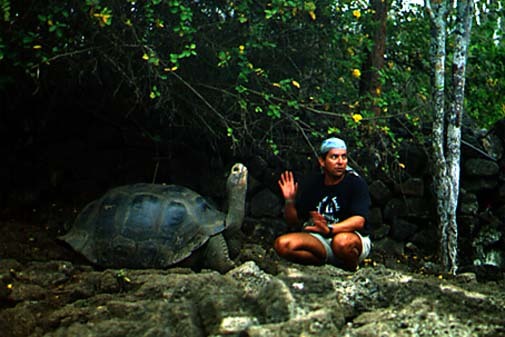 In addition, the introduction of domestic animals to the islands has furthered the decline of the tortoise populations. Cattle, and feral goats and donkeys compete with the tortoises for food; feral dogs, cats and pigs eat tortoise eggs and hatchlings, as do black rats, another introduced species. As a result, only about 10,000 tortoises remain today, and only the islands of Santa Cruz and Isabela have large populations. To combat the continuing decline of the giant tortoises, biologists of the Charles Darwin Research Station initiated a captive tortoise breeding project. 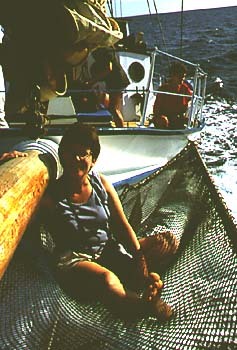 The 11 surviving tortoises on Española (Hood) Island were captured and brought to the Station for breeding. Here are two-year-old Española tortoises resulting from the continuing breeding program. When they are large enough to resist attack by dogs, pigs, cats and rats, i.e., five years old, they will be repatriated to their home island. 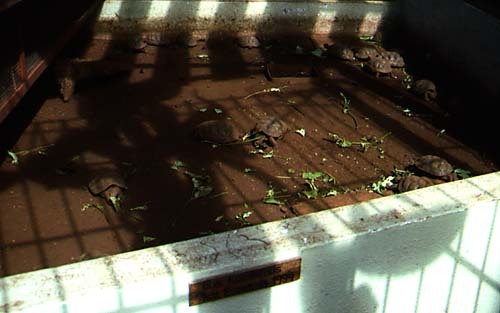 Tortoise eggs are collected from Pinzón Island, hatched at the Station, and raised until large enough to fend for themselves. They are then returned to Pinzón. All in all, six of the endangered tortoise subspecies have been successfully raised at the Charles Darwin Research Station. 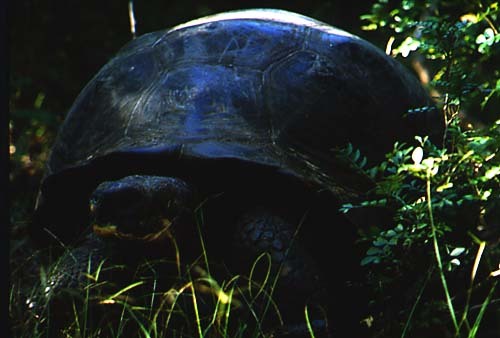 Unfortunately for the Pinta Island race, there is only a single surviving tortoise, a male found in 1972. Known as "Lonesome George", he lives out his days in solitude at the Station as hopes fade that a female Pinta tortoise will ever be located in one of the world's zoos. In addition to the captive breeding project, the elimination of domestic animals from the tortoise habitat is a goal of the Galápagos National Park Service. Already feral goats have been eradicated from some of the smaller islands, and in 1997 a major effort was started on Isabela to eliminate the goats from Volcán Alcedo, an important tortoise habitat. 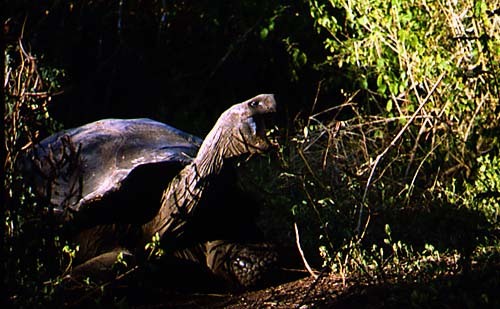 An adult tortoise, photographed at the Charles Darwin Research Station, exhibits a pronounced stretching reaction when touched on the neck. In the wild, the galápagos are seen to do this to permit birds to pick parasites from the folds of their skin. A vermilion flycatcher riding a tortoise is probably searching for parasites. In 1835, when the HMS Beagle brought Charles Darwin to the Galápagos, land iguanas were so abundant that the crew had difficulty finding a spot big enough to pitch a single tent that was not undermined with iguana burrows. Today these big yellow lizards remain abundant on only three islands, Santa Fé, South Plaza, and Fernandina. And once again, the culprit is man, for, like their mainland relatives, the Galápagos land iguanas are considered good eating. On Baltra Island, bored U.S. servicemen stationed there during WWII used land iguanas for target practice. And like the tortoises, the iguanas have been decimated by introduced species, domestic and feral. 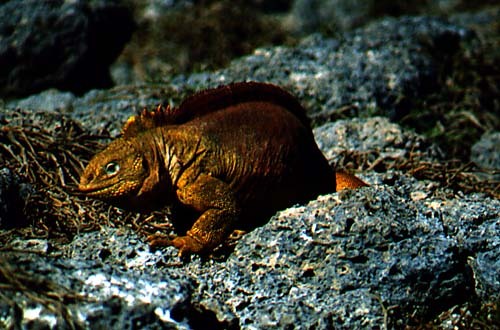 Iguanas were relatively common on Santa Cruz Island until ravaged by feral dogs in the 1970's. Like the tortoises, the iguanas are being bred at the Charles Darwin Research Station, and repatriated to their native habitats. 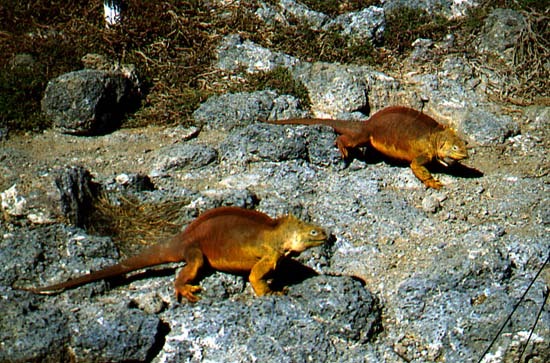 This pair of iguanas was photographed on South Plaza Island, one of the best localities for tourists to see the land iguana. Like the tortoises, Conolopholus subcristatus is endemic to the Galápagos; there may be several distinct species, a point still being investigated by biologists. Also like the tortoises, the iguanas are herbivorous. 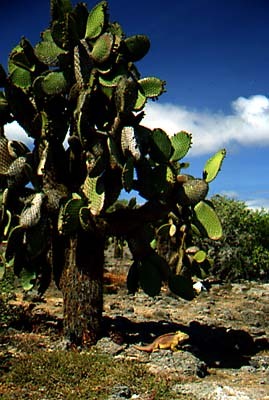 On the smaller, more arid islands, both animals eat prickly pear cactus, Opuntia, which has evolved a trunk-like structure that lifts the mature cactus off the ground and out of reach of the herbivores. Amblyrhynchus cristatus, the endemic Galápagos marine iguana, is the world's only sea-going lizard; but in spite of its adaptations to swimming and feeding on the sea bottom, the creatures are still basically land animals. 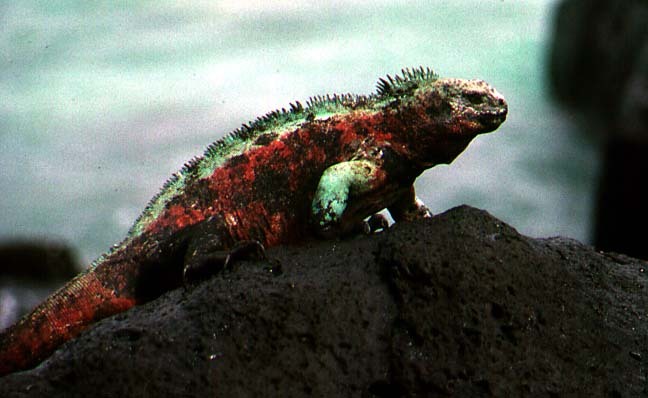 The Española marine iguana shown here displays the red and blue-greenish colors that sets these iguanas apart from the black specimens found on the other islands. 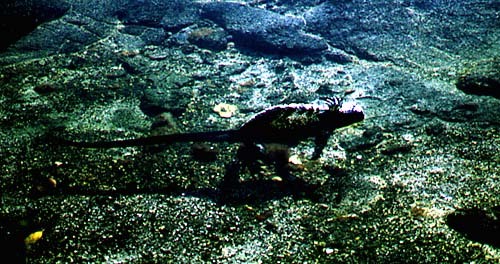 Marine iguanas swim using their tails to propel them. They feed on marine algae exposed during low tide and also underwater beyond low tide exposure. Big males can dive as deep as 12 m (40 ft), and stay underwater for up to 30 minutes. Before feeding underwater, the iguanas must sun to raise their body temperatures up to about 36 degrees C (97 F). Note the lava lizard on the tail of one of these sunning iguanas on Punta Espinoza, Fernandina Island. Once underwater, they cling to the bottom with their long, clawed toes, and graze on the algae covering the rocky sea floor. Because of the Humboldt current, which sweeps northward along the Pacific coast of South America, the sea is surprisingly cold, even at the equatorial latitudes of the Galápagos. As a result, the marine iguanas may lose as much as 20 degrees of their body heat on extended dives, necessitating another round of sunning upon their return to shore, as these flopped out fellows are doing. Note the patches of white on their heads. The marine iguanas have evolved special salt excretion glands to enable them to get rid of the excess salt taken in as they graze underwater. The white patches are salt crusts, formed when the iguanas "sneeze", expelling a mist of salt spray. Here Hood mockingbirds pick parasites off resting iguanas. 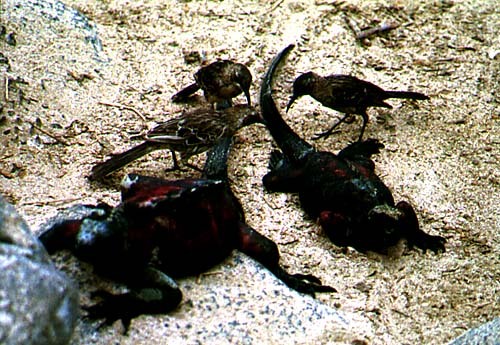 The marine iguana has few natural enemies. It is not relished by man for food --could it be their diet of algae or excess salt content? ?-- and their numbers have not declined like the land iguana. 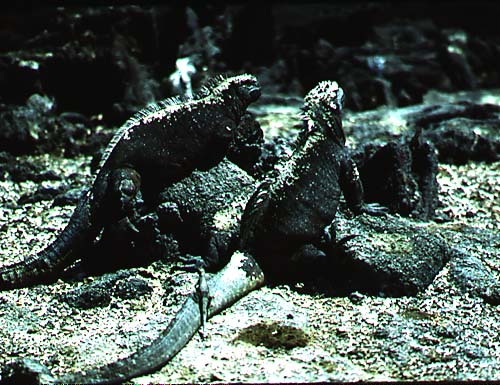 Biologists estimate the total marine iguana population in the islands to be 200,000 to 300,000, and they can be seen in abundance in many places, forming a seemingly prehistoric scene. Besides the iguanas, two other families of lizards inhabit the Galápagos Islands: the geckos and the lava lizards. 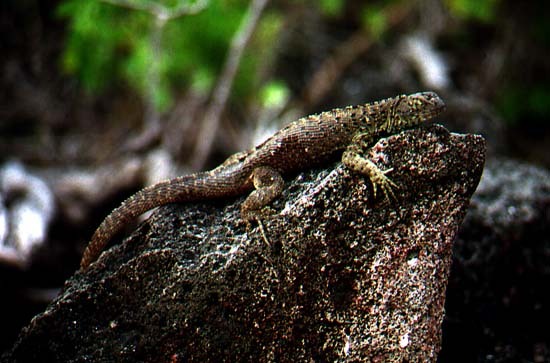 Of the two, the lava lizards are better known to casual visitors as they are common and active during daylight hours. A male lava lizard suns on a rock, a typical activity when not catching insects and other small invertebrates. 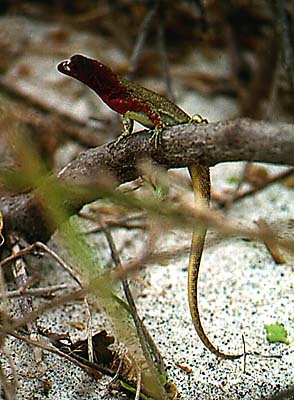 The female lava lizard is readily distinguishable from the male by her red throat coloration. Lava lizards are found on all the major islands, but their survival on Santa María (Floreana) is threatened by black rats and feral cats. 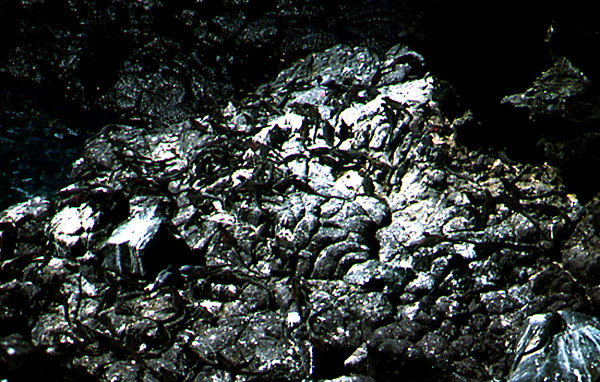 Several species of lava lizards have evolved, with only a single species being found on any one island. Three species of snakes are found on the Galápagos Islands, all non-venomous. 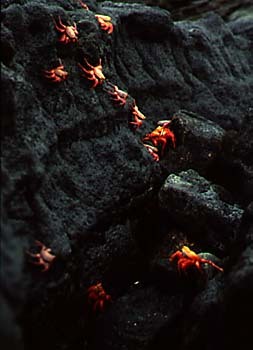 Two species inhabit the western and central islands, and the third species, Dromicus biserialis, here photographed on Española, inhabits the southeastern islands. The snakes are elusive and their life habits not well known. There are few indigenous land mammals on the Galápagos Islands, and none are large: two species of bats, and three species of endemic rice rats. It is easy to imagine how bats, like birds, might be blown out to sea by storms, to arrive at the Galápagos. But truly land-bound reptiles and mammals must somehow float across the ocean to colonize the islands. Each year, flooding rivers sweep masses of floating vegetation out of the South American mainland. Many of the masses carry hapless trapped animals out to sea, most to certain death by thirst or drowning. Reptiles, better able to go long periods without food and fresh water, are more likely to survive a long sea trip than mammals, hence the Galápagos have been colonized more frequently by reptiles than by mammals. Amongst the mammals, small herbivorous mammals have a better survival chance on a vegetation raft than large species. Thus the few terrestrial mammals that have made it are small omnivorous species. There are no indigenous large carnivorous mammals on the islands, a factor that helps explain why many of the animals have lost their fear instinct. The famous (infamous?) Galápagos blue frog, Rana galapagoensis matlocki is a plastic fake planted by a good-natured hoaxter to freak out his fellow travellers, including the park naturalist. 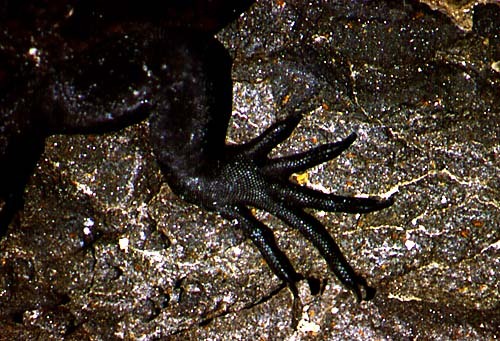 In actuality, there are no amphibians native to the Galápagos archipelago. Evidently these moisture-dependent animals cannot survive the trip by raft from the mainland to the islands, and for this reason the islands have never been colonized by amphibians. The Galápagos Islands are all volcanic islands, formed at a "hot spot" located below the westernmost islands of Fernandina and Isabela, which are the youngest islands (about 1 million years old), with still-active volcanoes. Due to the southeastward motion of the Nazca plate, the volcanoes produced over the hot spot are gradually carried away from the source of vulcanism. When this happens they go extinct, only to be replaced by a new volcano back at the hot spot. 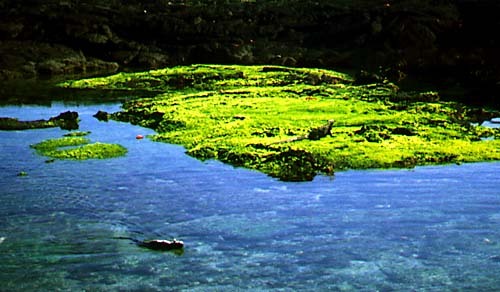 Thus the Galápagos Islands form a trail of islands progressively older and more eroded to the southeast. The southeastern islands are 3 to 4 million years old. Because of their greater age, the southeastern islands have had more opportunities to be colonized by life, and life has had longer to evolve there. This appears to explain why many of the animals of the southeastern islands are notably different from those the rest of the archipelago. 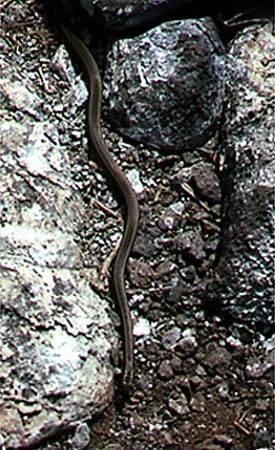 For example, of the three species of Galápagos snake, the striped species found on Santa María (Floreana), Española (Hood), and San Cristobal differs greatly from the two spotted species found in the younger central and western islands. Of all the Galápagos mockingbirds, the Hood mocker is the most distinctive due to its extra long, curved beak. 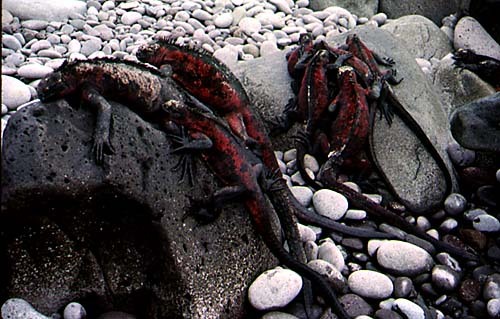 And, as noted earlier, the marine iguanas of Española, although the same species as on the other islands, are made distinctive by their red coloration. The best way to get to know the marine creatures is, obviously, to get in the water with them. Indeed, a daily snorkelling or scuba diving outing is one of the highlights of a visit to the islands. The waters are clear, and the myriad forms of marine life, plant and animal, vertebrate and invertebrate, are colorful and fascinating. Sea urchins, coral, sea cucumbers, rainbows of many-hued fish, octopi, sea turtles, docile white-tipped reef sharks, rays, penguins, starfish, bright green algae, chitons, sea lions, fur seals, diving boobies, and much more. One surprising feature of the Galápagos is the water temperature, which is about 21 degrees C (70F) from January to April, and about 19C (66F) May through December. As mentioned earlier, the Humboldt current sweeps northward from Antarctica, bringing cool and nutrient-rich waters to this area. Thirty or forty minutes in water of this temperature can chill you pretty thoroughly. Some visitors bring wet suits and are glad they did, but most get by with less elaborate protection. A very practical approach is to bring a couple of pairs of two-piece polypro longjohns. The polypro will not only keep you warmer, it will protect you from sunburn. If one layer is insufficient for warmth, they can be worn double. Although one should definitely get in the water to see the marine life at best advantage, quite a lot can be seen from the shore, as the following photos will attest. 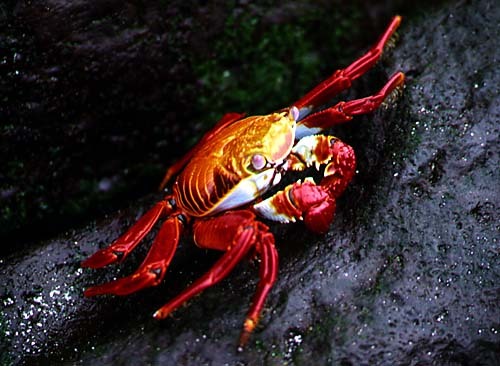 A ubiquitous denizen of rocky shores in the Galápagos is the outrageously colorful Sally Lightfoot crab. When visitors get too close, these bright invertebrates scuttle away to safety in cracks and behind rocks, for they are prey to shorebirds such as herons. However, if you take a lesson from the heron's hunting technique and remain motionless for some time, the crabs may come out of hiding and creep quite close. Another approach is to swim up to the rocks where the Sally Lightfoots congregate; they do not seem to be as frightened by creatures approaching them from below as by creatures that tower over them! 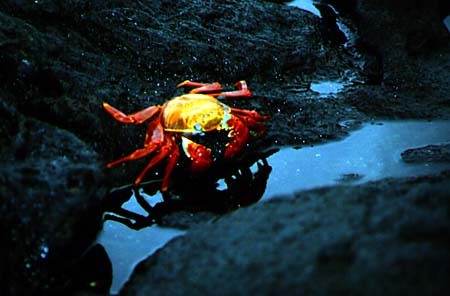 Many small dark grey crabs may also be seen on rocky shores with the larger, gaudy Sally Lightfoots. These small, drab crabs are actually immature Sally Lightfoots. 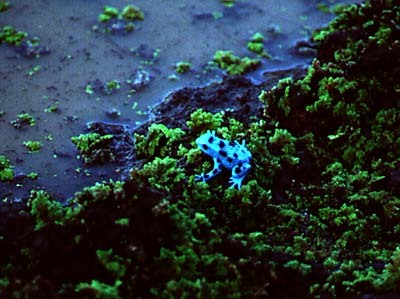 Being more vulnerable to predators than the larger adults, they have a protective camouflage coloration. The Pacific green sea turtle, Chelonia mydas agassisi, is the only marine turtle resident in the Galápagos Islands. Snorkelers commonly see the huge (up to 150 kg) beasts silently gliding by in the shallows. And in the breeding season, November to January, they are present in great numbers at some sites; about two dozen can be seen in this shot taken at Stingray Beach on Santa María (Floreana) Island. 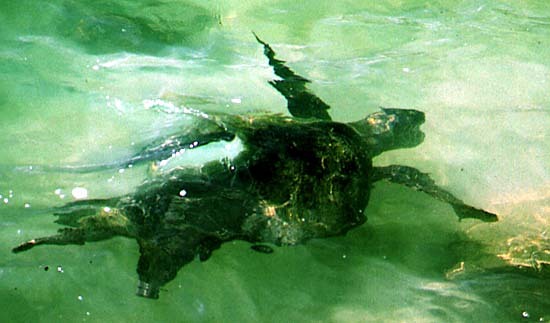 Male turtles chase females through the water, where mating takes place. 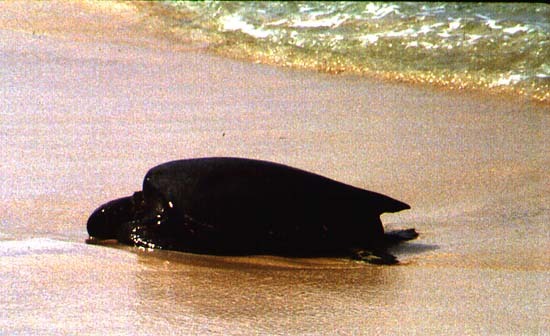 The females may mate with several males, over a period of hours, before finally clambering out on the beach exhausted to escape further amorous attentions. When egg-laying time comes, the females crawl up on the beach at night, beyond the reach of high tide. Here they scoop out a cavity in the sand with their hind flippers, deposit their eggs, and carefully bury them, never actually seeing the eggs themselves. 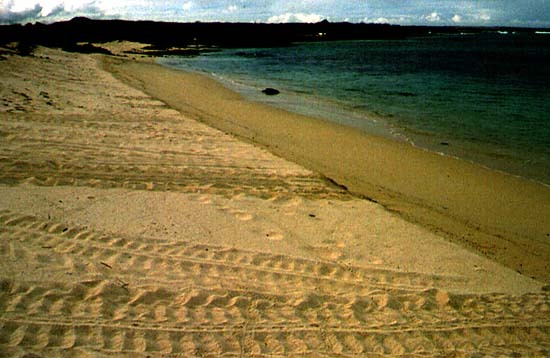 At daybreak the trails of turtle tracks give mute testimony to this nocturnal mission of motherhood. 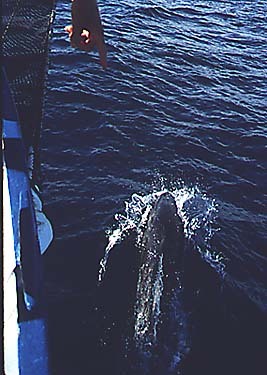 Galápagan waters are inhabited by a number of whale species, including the sperm whale (cachalote, in Spanish). 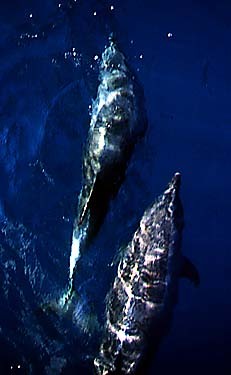 But the most commonly sighted cetaceans are the common bottle-nosed dolphins. These playful beasts are often drawn to cruising yachts, apparently because they get a kick out of riding the bow wave. Breaching, then diving they cavort about until suddenly, perhaps bored with the game, they streak away with amazing speed as if your boat were anchored instead of sailing along full tilt. A great place to be to watch the dolphins play is the bownet on some of the smaller and traditionally designed yachts such as the Cachalote. 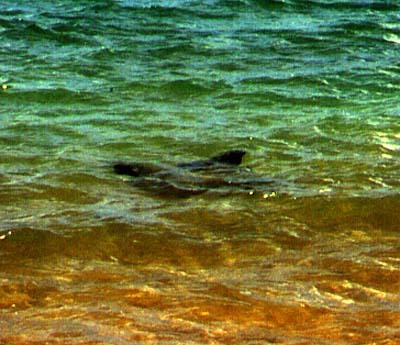 Several species of rays can be seen in the Galápagos. The most spectacular, but seldom seen, is the giant manta ray. The most thrilling commonly-seen ray is the spotted eagle ray. Adults are easily a meter across, and may be seen "flying" through the water or hovering over the bottom, undulating like a flying carpet. Yellowish mustard rays are also seen, sometimes in schools. While these rays are all harmless, there is one species, the stingray, that can inflict a very painful wound if accidentally stepped on. 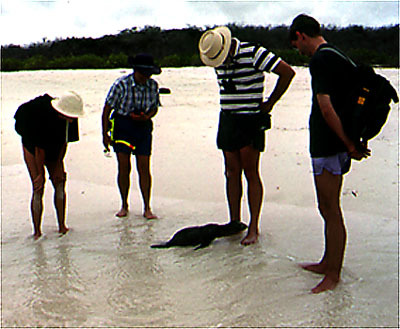 Stingrays are common at just a few beaches, and the guides will warn visitors before visiting sites where stingrays are a problem. When wading at such sites it is a good precaution to "shuffle" along the sandy bottom rather than stepping normally. This reduces the likelihood of placing a foot down on top of a resting stingray. 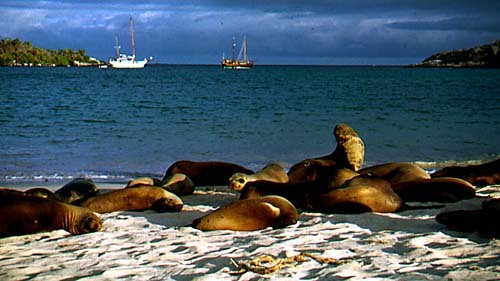 Probably most visitors' favorite marine animals are the sea lions that throng protected sandy beaches. A bit clumsy on land, they are superb aquatic acrobats. Furthermore, they are the most playful, frolicsome animals imaginable. They streak through the clear water, swirling and tumbling in a wonderful display of underwater gymnastics. Occasionally a sea lion will barrel through the water towards a snorkelling human swimmer, playing a sort of chicken-of-the-sea game, turning aside at the last moment and swirling a cloud of bubbles into the snorkeler's face. Sometimes they come up behind swimmers and nibble on their flippers! And sea lions have been known to catch marine iguanas by the tail and pull them out to sea, release them, then catch them again just as they are about to clamber out onto the shore, and tow them back out to sea. 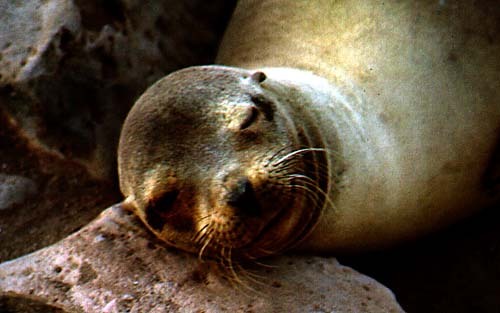 Sea lions are the clowns of the Galápagos! 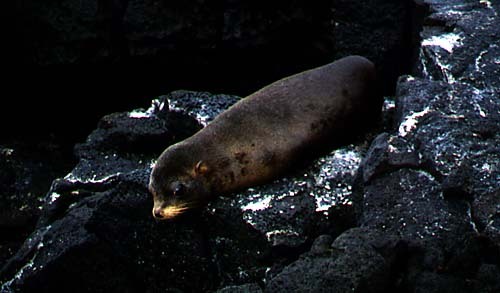 The Galápagos sea lion, which is actually an endemic subspecies of the California sea lion, Zalophus californianus, is the most common mammal native to the islands. The total population is estimated at around 50,000. Indeed, at some visitor's sites one has to pick one's way around dozing sea lion cows on the beach. However, it might not be such a good idea to get so close to a cow with a pup, such as this nursing new-born still trailing his umbilical cord on the sand. Definitely to be given a wide berth is a full-grown sea lion bull. Bulls are recognizable by their bulbose foreheads. Although sea lions appear clumsy on the land, they can move surprisingly fast, and a charging, 250 kg (550 lb) bull is not fun to watch coming your way. Bulls are territorial, and during the rutting season are especially aggressive. Incessantly barking a warning to potential rivals, a bull patrols his particular stretch of beach, where his harem of cows rests. Human swimmers straying into a bull's territory may get a warning in the form of a menacing close swim-by. The best thing to do in such a case is turn back out to sea and swim a bit further down the shore, for it is the stretch of beach with his harem that the bull wants interlopers kept away from. Bulls commonly fight, giving each other serious bites. They have also been known to been bite snorkellers who failed to heed their warning signals. One feature that pretty pictures of sea lion groups can't capture and which the guidebooks never prepare the visitor for, is the powerful smell of sea lions. They are really whiffy, and it is not perfume! Aside from aggressive bulls or worried mothers with pups, sea lions are so thoroughly charming that it is difficult not to want to touch them. This is surely true of the big-eyed pups. 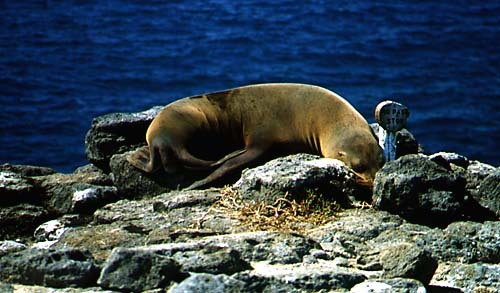 But visitors should remember the park rules and not pet, feed or do anything that interferes with the natural behavior of the sea lions and other animals on the islands. The rule is "you can't touch them, but they can touch you": a curious pup checks out the strange skinny white critters standing on his beach. Another park rule that visitors need to respect is to stay on the marked trails. And if the sign says No Pase, you better believe it! 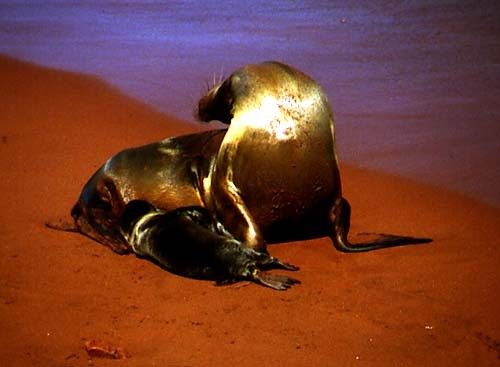 Like the California sea lion, the fur seal is a pinniped, but it is smaller and far less abundant. 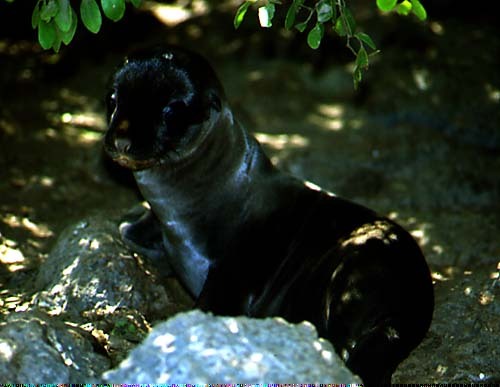 Unlike the sea lion, Arctocephalus galapagoensis is an endemic species, found only in the archipelago, but closely related to the South American fur seal Arctocephalus australis. 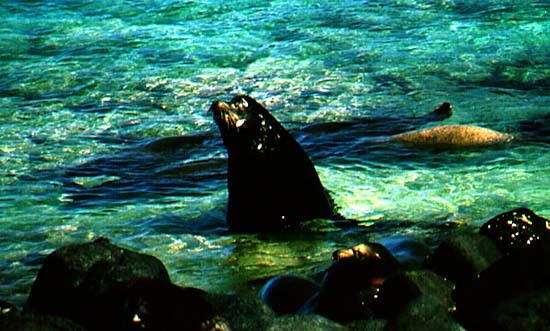 Fur seals are named for their thick, luxuriant fur, which in fact, nearly proved the undoing of the Galápagos species. They were hunted nearly to extinction for their valuable pelts, until, in the 1930s the Ecuadoran government gave the species protection. 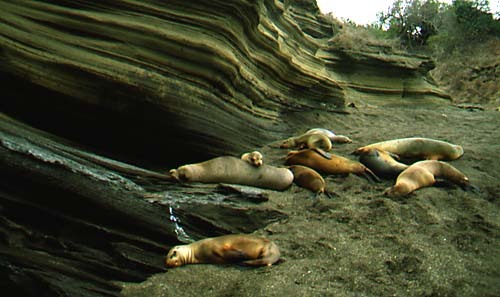 Whereas sea lions live in large colonies and prefer protected beaches, fur seals tend to live in smaller groups, on steeper, rocky shores. 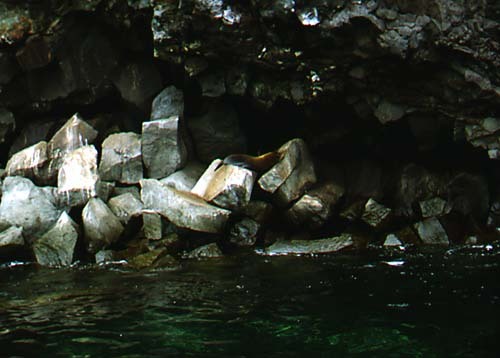 This snoozing fur seal was photographed below the cliffs at Prince Philip's Steps on Genovesa (Tower) Island. And though they both dine on fish and squid, fur seals differ from sea lions in that they feed mainly at night, diving to depths that average only 30 m (100 ft) (maximum, 85 m, 280 ft). 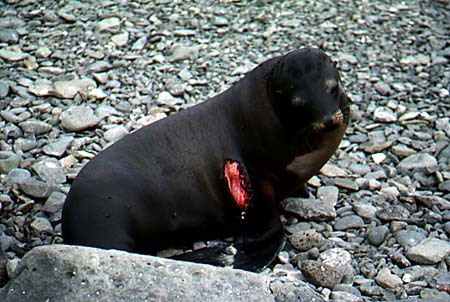 In contrast, the sea lions fish during the day and dive deeply, averaging 40 m (130 ft) (maximum, 180 m, 600 ft). COMING SOON: Birds of the Galápagos. Photos are being scanned in, so come back and take a second look later. Want to see these fascinating creatures for yourself? Click here.